My oldest niece turned 7 in August and decided that for her birthday she wanted an American Girl doll. 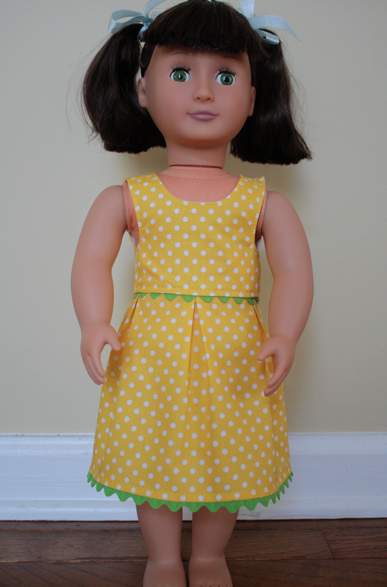 I wanted to help celebrate her great new doll and thought clothes would be the perfect gift. What does a girl love more than clothes? Well, after looking around at the price of American Girl doll clothes, I decided to make my own. An Internet search for patterns left me empty handed. Nearly everything I found was for knit or crochet and I don’t do either. 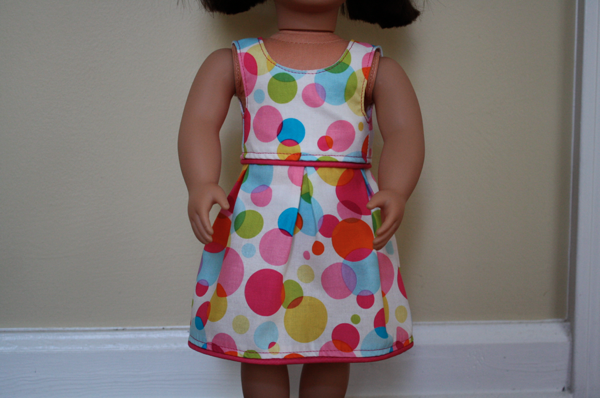 So I bought my own AG knock-off doll, got out a tape measure and some paper and got to work. Before I knew it I was sewing dress after dress! I have a gazillion more ideas for clothes and I can’t wait to turn them into patterns to share! So to honor my sweet niece, I named my first dress pattern after her. This is The Katie Dress! As a kid, I hated that my doll clothes closed with velcro. After a few weeks they were always gunked up with cat hair, doll hair, fuzz, and whatever else found its way to the velcro. So I wanted to create clothes that had real world methods of closure. 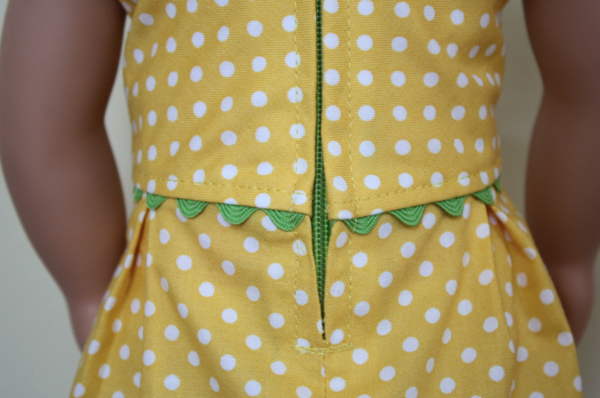 So, The Katie Dress has a zipper back! And sweet rick rack details. Or, if you prefer, piping! 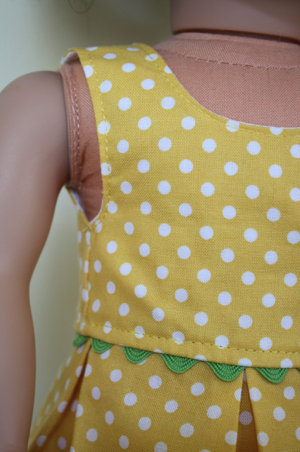 These dresses are amazingly simple to construct. Each one took me about an hour and used leftover scraps of fabric! I hope you’ll enjoy making them as much as I do! To print the pattern pieces correctly, set your margins to 0 and print. There is a 1″ by 1″ square on each piece to verify your pages printed at the correct size for an 18″ doll. It’s a scale measurement. When you print, that square needs to measure 1″ by 1″. If it does, the pattern pieces are the right size. Thanks so much–just hadn’t heard that but I’m new at getting patterns from the computer. That little dress is so cute! Thank you for the great tutorial. What size zipper did you use? I think it was a 9″ zipper. But the length doesn’t matter, you can use any size zipper and cut off the excess. Love this pattern, but I had trouble turning the top inside out. What am I doing wrong? Wonder if snaps would work, or if I would need to make the top piece bigger in the back. I love Babyville plastic snaps, so easy! Hi, thank you so much for this pattern. I have just finished making a halloween witch outfit with it. I adapted it slightly because my daughter likes a velcro fasten. It’s a brilliant dress pattern. Thanks again. Thank you so much for this pattern! I have used it multiple times for gifts and it has saved me so much money! And it’s quality made with the top stitching and zipper. Thank you! Thanks so much for sharing this pattern with us. 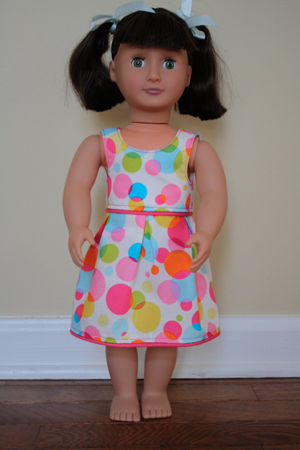 My granddaughter is 5 years old and just starting to actually put clothes on her dollies instead of taking them off! She asked me to make her some doll clothes for Christmas. Perfect timing. Thank you for the wonderful pattern! It was so quick and easy. I used the piping version. When putting in the zipper, I realized that the piping created too much bulk at the waist. I used tweezers to pull some of the piping out of the enclosing fabric and snipped off about 1/2 inch. This reduced the bulk so that the zipper went in more smoothly without destroying the colorful effect of the piping. I then did the same thing to the piping trim at the bottom. When turning the top, I use a good sized safety pin. I attached it to the fabric that is most distant from the shoulder and then pushed the safety pin through the shoulder. It gave me something to hold on to and was a great way to pull the rest of the fabric through. I still had to tug a bit but I didn’t need to use anything to push it. Thank you for these tips, Bonnie! I downloaded your pattern and instructions some time ago. I’m just now getting around to cutting out the Katie dress. The instructions say to use a 1/8 inch seam. Is that correct? It seems like such a tiny seam allowance. Just wanted to check if that is correct or a typo. Thanks. Melissa	March 02, 2014 - 11:30	– In reply to: Mary H.
I love the idea of zipper instead of Velco!! Am going to make several for my granddaughters!!!! I appreciate your sharing the free pattern!!! I just finished making your pattern. It’s the first doll pattern I’ve tried and it came out just beautiful! It’s so well written and easy to follow. Thanks for sharing it! Thank you so much for the pattern. 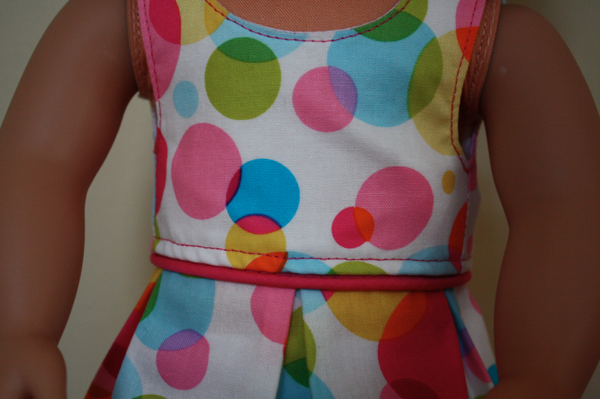 It is just so cute and seems nice and easy for my granddaughter to sew. 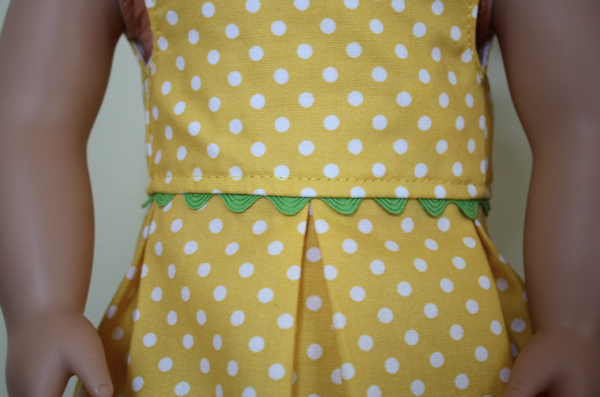 This pattern was so easy, and the results were great! I have adapted the pattern in various ways to create a different look (ie: shorten or lengthen the hem, added a ruffle around the bottom hem, gathered the skirt instead of pleats, added sleeves, raised the neckline, eliminated the zipper in the back and put buttons up on the shoulders……etc) Thanks so much for this versatile pattern. My granddaughter loves her new doll clothes,and so do my nieces! Very cute–and it looks so easy too.